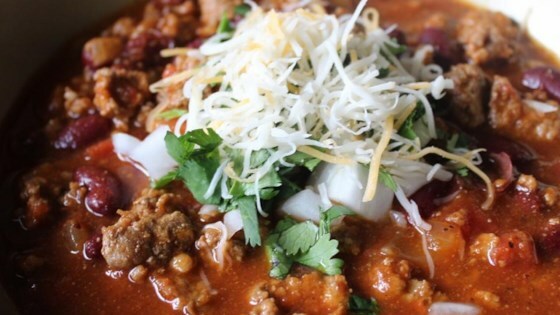 "The chipotle peppers give this slow cooker chili a subtle, smoky flavor. Add more minced chipotle peppers to taste. Serve with sour cream, sharp Cheddar cheese, and chopped fresh cilantro." Cook sausage and ground beef in a large pot over medium-high heat until lightly browned and crumbly. When the meat has released its grease, and has begun to brown, drain off accumulated grease, and season with chili powder, cumin, and coriander. Cook and stir for 1 minute until fragrant, then stir in the garlic and onion. Cook until the onion has softened and turned translucent, about 4 minutes. Stir in the diced tomatoes, tomato sauce, kidney beans, chipotle peppers, salt, and pepper. Bring to a simmer, then pour the chili into a slow cooker. Cover, and cook on Low for 8 to 10 hours. Stir in tomato paste an hour before the chili is done. This chili satisfies any time of year. Make it the night before. Ready? Go team! I used the entire can of Adobo Peppers, including the sauce. It added quite the kick, but it tasted fantastic.